June is National Soul food Month, celebrating the heritage and history of the foods and foodways of African Americans and peoples from the African diaspora. The culinary contributions of this group had an indelible impact on the American menu. So many of the mouthwatering dishes she created are the prized foods we consider soul food—collards, kale, mustard, and dandelion greens; cornbread, potlikker, ham, buttermilk fried chicken, sweet potatoes, tea cakes, chow-chow, red beans ‘n rice, black-eyed peas and so many good things to eat. Sure we can buy them, order them to carry-out or pick-up a convenience version of them at the supermarket, but they’re just not the same. Celebrate the month recognizing the heritage of these foods by adding your own version of Big Mama’s soulful dishes to the menu. Try cooking from scratch or scratch convenience, mixing in a little lagniappe* or something extra or creating your signature recipe. It might not be Big Mama’s, but if you’re cooking with love, you’ll just need to remember practice makes perfect. In 2-quart saucepan, combine water and ham hock. Bring to boil; reduce heat. Cover, simmer 1 to 2 hours, or until tender. Remove ham hock; chill broth, until fat can be spooned off surface. Discard fat. Remove meat from ham hock, trimming fat. 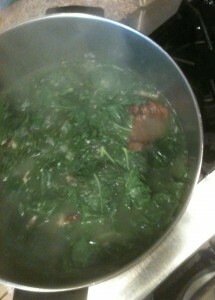 Use fresh greens in place of frozen, if desired.